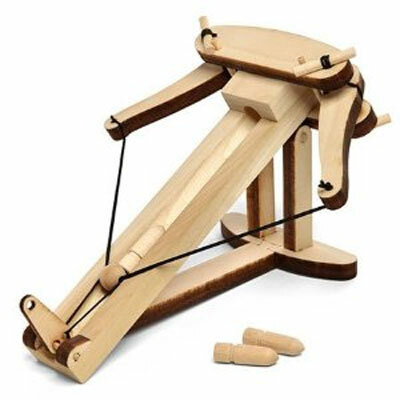 Wooden Ballista Kit is Perfect for Cubicle Warfare! GearGuyd > Cool > Wooden Ballista Kit is Perfect for Cubicle Warfare! This laser-cut hardwood ballista kit provides a nice way to add a bit of fun into your day. It is modeled after Roman designs and features interlocking parts for quick and easy assembly. There are tons of small tabletop catapults, trebuchets, foam dart launchers, marshmallow shooters, and other such implements of cubicle warfare, and this ballista would make a fine addition to any arsenal. Although these parts are laser-cut, it should be possible to build a near look-alike with conventional tools. Of course, if you don’t already have a scroll saw, router, and a drill, the DIY route will cost a lot more than the kit’s reasonable $22.